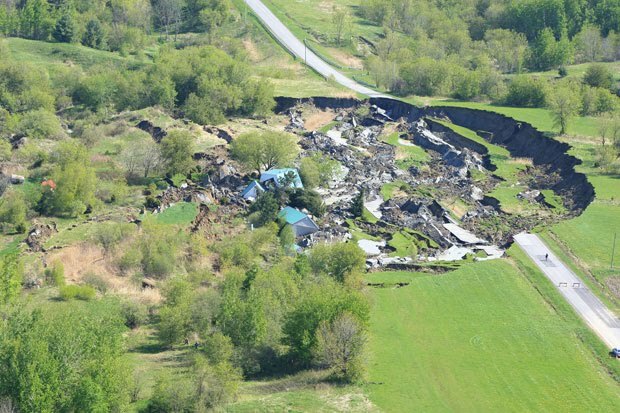 The home, located in the pastoral farmland about 75 kilometres outside of Montreal, disappeared into the sinkhole’s gaping maw around 9:30 p.m. Monday. The missing family is a mother and father in their forties and their two children, aged nine and 11. Residents identified the father as Richard Prefontaine. Unconfirmed reports suggested that the family was in their basement when the house was swept away. Rescuers found the family dog , which according to a police spokesman had been tied to a tree outside the home and survived the slide. “In front of him lay ‘a different kind of blackness,’ Gagnon recounted yesterday, at a security perimeter erected two kilometers from the sight of the sinkhole.